Ethanol and other biofuel mandates and subsidies got started when politicians bought into claims that we are rapidly depleting our petroleum, and fossil-fuel-driven global warming is boiling the planet. Hydraulic fracturing destroyed the depletion myth. It also reminds us that “peak oil” applies only if we wrongly assume that resource needs and technologies never change. The 18-year “hiatus” in planetary warming has forced alarmists to change their terminology to climate change, climate disruption and extreme weather mantras – which allow them to continue demanding that we stop using the hydrocarbons that provide 82% of the energy that makes our economy, jobs and living standards possible. In recent years, people have discovered that ethanol harms lawn mowers and other small engines. The fuel additive also drives up gasoline prices, reduces automotive mileage and corrodes engine parts. The 10% blends are bad enough. 15 percent ethanol is much worse, and truckers say a highly corrosive 20 percent blend will be needed to meet California’s looming low carbon fuel standards. US law mandates that ethanol production must triple between 2007 and 2020 – even though motorists are driving less and thus using less gasoline, which then means refiners need less ethanol to produce 10 percent blends. That “blend wall” (between what’s needed and what’s produced) is driving the push to allow 15 percent ethanol blends, which would void most car engine warranties. The subsidies and guaranteed income incentivize farmers to take land out of conservation easements, pasture land and wildlife habitat, and grow corn instead. Just to meet current ethanol quotas, US farmers are now growing corn on an area the size of Iowa. Growing and harvesting this corn and turning it into ethanol also requires massive quantities of pesticides, fertilizers, fossil fuels and water. Corn-based ethanol requires 2,500 to 29,000 gallons of fresh water per million Btu of energy – compared to at most 6.0 gallons of fresh or brackish water per million Btu of energy produced via fracking. Across its life cycle, ethanol production and use also releases more carbon dioxide per gallon than gasoline. Now we learn that ethanol is bad for the environment in another way. It kills marine life. A large portion of the nitrogen fertilizers needed to grow all that corn gets washed off the land and into streams and rivers that drain into the Gulf of Mexico, where they cause enormous summertime algae blooms. When the algae die, their decomposition consumes oxygen in the water – creating enormous low-oxygen (hypoxic) and zero-oxygen (anoxic) regions. Marine life cannot survive in those “dead zones.” Fish swim away, but shrimp, oysters, clams, mussels, crabs, sea cucumbers and other stationary or slow moving bottom dwellers cannot escape. They just die. Thousands of square miles of water off the coast of Alabama, Mississippi, Louisiana and Texas as far southwest as Corpus Christi can remain blanketed by a dead zone until fall winds or tropical storms or hurricanes come through. These events cool the water down, churn up the anoxic zones, bring in new oxygen supplies, and restore livability. In 2012, nearly 2,900 square miles (about the size of Delaware) turned into a dead zone. Last year, because of much greater water flow from the Corn Belt, the region of animal cadavers covered nearly 8,560 square miles (New Jersey). This year, the zone of death could cover a more average Connecticut-size 4,630 to 5,700 square miles, say Louisiana State University, Texas A&M and other researchers, due to lower water flows; strong eddy currents south of the Mississippi Delta could also be playing a role. A friend of mine recently observed vast stretches of green algae blooms in the normally “blue water” areas beyond the 15-mile-wide region where fresh Mississippi River waters mix with Gulf of Mexico salt water, in the Mississippi Canyon area south of Louisiana. The green zone extended to some 40 miles from shore, he said. As the algae die, they will create huge new suffocation zones, rising up into the water column, invisible from the air and surface, but deadly to millions of creatures that cannot swim away. The dead zones also mean fishermen, crabbers, shrimpers and other recreational and commercial boaters must travel much further from shore to find anything, putting them at greater risk in the event of storms. “More nitrate comes off corn fields than it does from any other crop, by far,” says Louisiana State University zoologist Gene Turner. The nitrogen drives the formation of dead zones, and the “primary culprit” driving the entire process is corn-based ethanol, adds Larry McKinney, executive director of the Harte Research Center for Gulf of Mexico Studies at Texas A&M University in Corpus Christi. 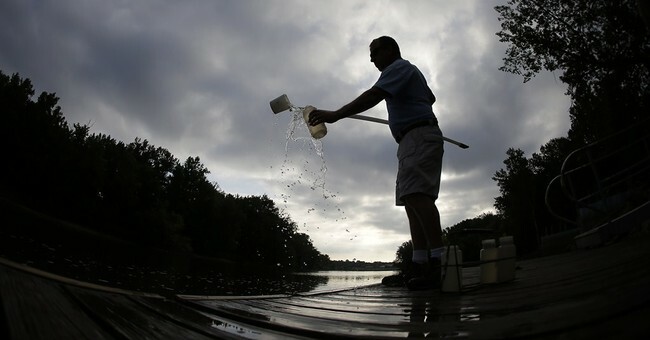 The US Geological Survey estimates that 153,000 metric tons of nitrogen fertilizer and other nutrients flowed down the Mississippi and Atchafalaya Rivers in May 2013. That was 16% more than the average amount over the previous three pre-ethanol decades. The enormous nutrient runoff is primarily the result of feeding just one crop: corn for ethanol, the USGS affirms. Fertilizer and pesticide runoff is substantially higher in wet years. But in dry years much of the excess chemical application just builds up in the soil, waiting for the next big rainy season to unleash it. The more acreage we put in corn for ethanol – and soybeans for biodiesel – the worse the fertilizer and pesticide runoff, algae blooms, dead zones and eradicated marine life become in wet years. Water use is also skyrocketing to grow these biofuel crops. And if it weren’t for biotechnology, the problems would be far worse. GMO corn is engineered to need less water, and to kill insects that feed on the crops with far lower pesticide use than for traditional, non-biotech varieties. However, the same greens who hate hydrocarbons and promote ethanol and biodiesel also detest biotechnology. Go figure. Some biofuel advocates tout cellulosic ethanol as a partial solution – because switchgrass requires less fertilizer, and this perennial’s roots help stabilize the soil and reduce runoff. But no one has yet been able to turn this pipedream source into ethanol on a commercial scale. Another potential manmade fuel could be methanol from natural gas produced via hydraulic fracturing, but greens continue to oppose fracking. This algae boom, bust and dead zone phenomenon may not be an ecological crisis, and it’s been going on for decades. But why make it worse, with an expensive, engine-wrecking fuel that eco-activists, politicians and ethanol lobbyists pretend is better for the planet than fossil fuels? Why don’t biofuel boosters at least include this serious, recurring environmental damage in their cost-benefit analyses? And why do we continue to tolerate the double standards? Environmentalists, politicians and bureaucrats come down with iron fists on any private sector damages involving fossil fuel or nuclear power. They have different standards for the “natural” and “eco-friendly” “alternatives” they advocate. Ethanol from corn is just one example. An even more grotesque double standard involves wind turbines. Big Green activists and Big Government bureaucrats (especially Fish & Wildlife Service) let Big Wind companies kill eagles and other raptors, conduct deliberately insufficient and incompetent body counts, hide and bury carcasses, and even store hundreds of dead eagles in freezers, away from prying eyes. Using German and Swedish studies as a guide, Save the Eagles International experts calculate that the real US wind turbine death toll is probably 13 million or more birds and bats every year, slaughtered in the name of saving the planet from computer-concocted ravages of manmade global warming. These policies are unsustainable and intolerable. The same environmental and endangered species standards must be applied to all our energy alternatives – and the ethanol quotas must be terminated.